Mandal, a sleepy little taluka in Ahmedabad district of Gujarat famous in the world for its cumin, has become the nerve centre of agitations over land rights in the past few months. Farmers and graziers around the taluka are unwilling to give their land to the state government for setting up industrial hubs. They have been opposing the proposed special investment regions (SIRs), saying industries cannot match the benefits from tilling the soil and rearing animals. Buckling under pressure, Chief Minister Narendra Modi on August 14 shrunk the size of Mandal-Bahucharaji SIR (MB-SIR)—one of the 13 SIRs planned in the state. On May 14 this year, the government issued a notice in regional newspapers announcing land acquisition for MB-SIR. Its plan was to acquire nearly 50,880 ha of farm land from 44 villages of Surendranagar, Ahmedabad and Mehsana districts. Following protests, the government decided to exclude 36 villages from the project. Critics say Modi, the prime ministerial candidate of the Bharatiya Janata Party (BJP), gave in to farmers’ demand keeping in mind the upcoming Lok Sabha elections in 2014. Almost all the 44 villages had voted for BJP in the past three assembly polls. As a far-reaching impact of the agitation, many of Modi’s old aides and BJP-backed sarpanchs and taluka members have sided with farmers and graziers. “We campaigned for Modi in the previous elections. By categorising the land as infertile so that it can be acquired for industries, he has cheated farmers,” says Laxmanbhai Vanol, a senior BJP leader from Dasada village in Surendranagar. Similar sentiments are shared by Khanghar Dodhiya, a BJP leader and taluka member from Arwada village in Mandal. Arwada would have lost 2,000 hectares (ha) to MB-SIR. Days before the Modi administration shrunk the MB-SIR, Mandal taluka panchayat passed a resolution opposing land acquisition for SIRs. The protesting farmers, spearheaded by Jameen Adhikar Andolan-Gujarat (JAAG) and Azad Vikas Sangathan, now demand cancellation of the SIR Act passed by the state government in 2009 (see ‘Why SIR?’). In 2009. when the Gujarat government announced setting up special investment regions (SIRs), it said its move was in line with the Centre’s proposed Delhi Mumbai Industrial Corridor (DMIC) around the Dedicated Freight Corridor between the two cities. About 150 sq km of area on both sides of the corridor will be developed as industrial and commercial hubs. More than 38 per cent of the DMIC falls in Gujarat, which plans to develop 13 SIRs and four industrial areas, which will cater to manufacturing units, in the region. Almost one-third of the proposed investments of USÃ”Ã‡Ãª$90 billion in DMIC is expected to take place in Gujarat. Farmers say they were not consulted before the Gujarat government issued the land acquisition notice on May 14. According to the notice, the government plans to acquire land as per the 2009 rate while land price in neighbouring Sanand has trebled since the arrival of Tata Nano project that year. “Besides, it plans to pay only 60 per cent of the land price. This has irked the farmers even more,” says Laljibhai Desai of Azad Vikas Sangathan. 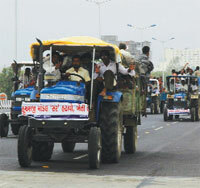 On June 18, about 5,000 farmers and graziers staged a tractor rally from Mandal to state capital Gandhinagar. Modi assured then that land would not be forcibly acquired. While that could have doused the anger of farmers and graziers to some extent, on June 20, the state government passed yet another order, intensifying the agitation. Sardar Sarovar Narmada Nigam Limited (SSNNL), responsible for extending the Narmada waters to various parts of Gujarat, denotified 2,922 ha of the Narmada Command area in Mandal taluka. The denotified area was part of MB-SIR. SSNNL officials, who did not wish to be named, told Down To Earth that water supply from the Narmada Canal was stopped to ease the way for Maruti-Suzuki, which has proposed a plant at Hansalpur village in Mandal (see ‘Maruti on illegal land?’). Hansalpur is one of the eight villages that are part of the downsized MB-SIR. There is no let-up in anger among farmers in Gujarat even after the government downsized the Mandal-Bahucharaji Special Investment Region (MB-SIR) from 44 villages to eight. A major reason is the government has already given away about 260 hectares (ha) of land in Hansalpur village to Maruti Suzuki for setting up manufacturing unit for small cars. The company has built a cabin on the site and appointed security guards. “How can the government allot land whose status is being contested in the court?” asks Ajmal Thakore, sarpanch of Hansalpur, who has joined protests against SIR. In 2004, when the state began computerising land records, officials mistakenly categorised 83 ha common grazing land in Hansalpur as wasteland, allege residents. Armed with government records from 1954 that shows that the land is common grazing and agricultural land, families depending on the land approached the High Court of Gujarat in 2010. The court is yet to pronounce the judgement. “About 120 people are directly dependent on the land. The government should have checked before giving it away,” says Thakore. Meanwhile, land prices in Hansalpur have skyrocketed. While the government allotted the land to Maruti Suzuki for Rs 2 lakh to Rs 5 lakh an acre (0.4 ha) in 2012, Ahmedabad-based real estate owners told Down To Earth that the land price around the proposed plant shot up by 12 times days after Osamu Suzuki, chairperson of Suzuki Motor Corporation, visited the site. Land brokers are trying to woo Hansalpur farmers with sweetened deals to sell off their land. “We remember what happened to Sanand farmers. They bought cars, apartments and spent all the money. Now after realising the mistake, they have joined the land rights movement against SIR. We will not commit the mistake,” says Karsan Bhai, Hansalpur resident. With assured water from the Narmada Canal, the Mandal-Bahucharaji region has witnessed tremendous agricultural growth over the past decade. Farmers in the region now grow three crops a year instead of one. According to the Unjha Agricultural Products Marketing Committee, which heads Asia’s biggest cumin seed wholesale market, the Mandal region grows one of the best varieties of cumin in the world. 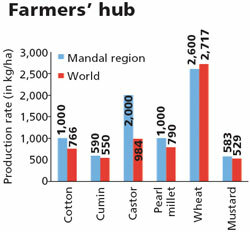 Production of other cash crops has also been above the world average (see ‘Farmers’ hub’). “Good agricultural production from the area makes land a prized possession in this region,” says Kaushik Sindhav from Vadgam village which lies in the periphery of MB-SIR. Sindhav returned from Kenya in 2011 and is growing cotton and cumin on the 100 ha he has inherited. “Under no circumstances, a farmer belonging to my rajput community would sell his land. Expecting us to part with our land is a big mistake of the government,” he adds. On August 15, soon after cancelling MB-SIR, the Gujarat government assured that the denotified commend area would soon be brought back under the Narmada Canal. However, farmers refuse to believe the verbal assurance. “We are yet to receive water from the Narmada canal,” says Sandhav. If implemented, the proposed project would have displaced 75,000 cattle that supply milk to government cooperatives as well as private dairies. Maldhari graziers, who depend on community grazing land, would have been the worst affected. At least 15 per cent land planned for MB-SIR was the common grazing land of the Maldharis. 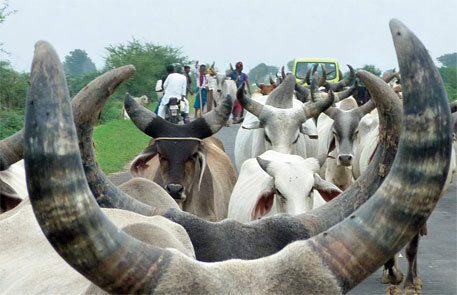 The community was planning to march its cattle all the way to Gandhinagar if the government did not cancel MB-SIR. “The agitation received full support of all the communities because land is their only source of living.” says Desai. The zeal to protect the resource is evident in the fact that in several villages men, women and children assemble within minutes at the temple as soon as drums roll calling for a meeting. “Cancellation of MB-SIR is only half the battle won. The farming community does not want fertile land to fall under the proposed SIR. The government will have to scrutinise the SIR Act keeping farmers in mind,” Desai says. Other protesters agree. It is well fought battle and the Prime Ministerial candidate of the BJP, first time in his political life bow down to the farmers rather any agitation. This was really a people's victory.